Art adds wild goose to an old classic. If you have moose or goose lard now is the time to use it! Starting off by getting the goose meat a nice golden brown before allowing the meat to stew. By pan frying the vegetable Art locks in the flavours of the lard, thyme and the natural flavours that came from the goose. Mixing everything together in one pot of home goodness. 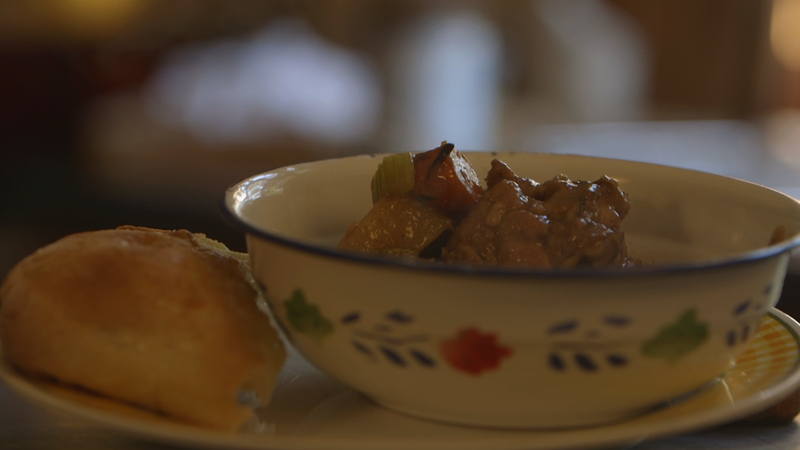 When it comes to comfort food not too much beats a good stew…maybe a piece or two of bannock. • 1 small goose – the meat cut off the bone and into cubes. • Heat half the moose lard in a hot skillet. • Dredge the goose pieces in flour and add to the skillet. • Brown over medium heat. Turn the goose pieces to brown on each side. • Heat the chicken broth in a stew pot. • Add the goose meat plus soy sauce and let simmer for 20 mins. • Heat the remaining moose lard in the skillet and add the diced vegetables and thyme. • When brown add to the stewing pot. • Add bay leaves and red wine and let simmer for 30 minutes. • Add the oatmeal and chicken bouillon and allow to simmer for another 10 minutes. • Serve in a bowl with freshly baked bannock.